Airport parking is a breeze when flying out of Orlando International Airport! 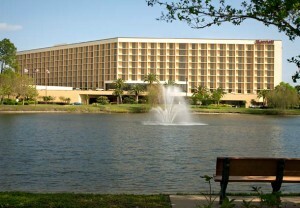 Snag a space offers convenient parking just five minutes from MCO at Orlando Airport Marriott. We’re delivering service and hospitality at rates you won’t find anywhere else! The hotel offers both self-parking and valet parking to our airport parking guests. Whether you decide to park your vehicle on your own or prefer one of our highly trained valets to park it for you, rest assured you will enjoy the convenience of a secure parking space and use of Marriott’s free MCO Airport shuttle. The hotel also keeps coffee on the pot all day for you to grab a quick cup of joe whenever you need that pick-me-up! The complementary airport shuttle runs 24 hours a day. The shuttle departs every 15 minutes from 5:00 AM to 9:00 AM and departs from the hotel every 30 minutes after that. To receive these discounted rates, snag a space requires that you book your airport parking reservation in advance. Pre-book your MCO Airport parking today!